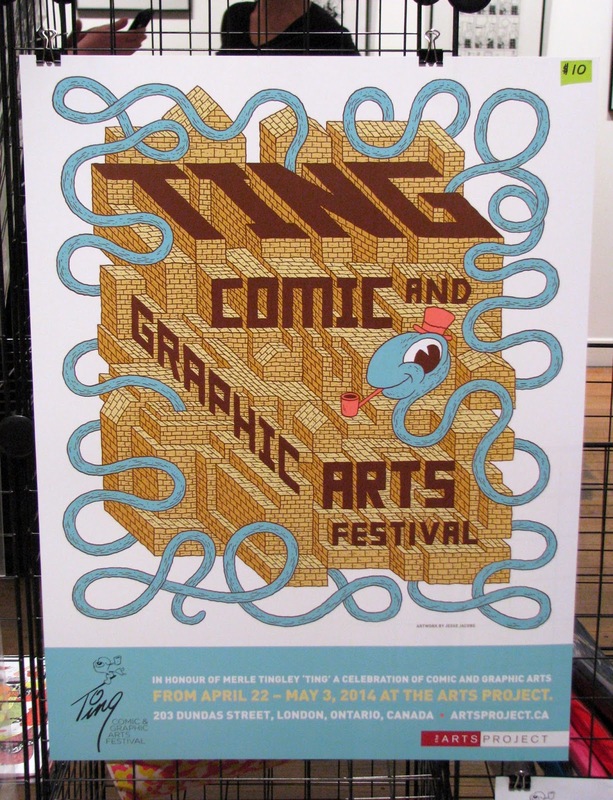 Last weekend I attended the launch party for the Ting Comic and Graphic Arts Festival at The Arts Project. 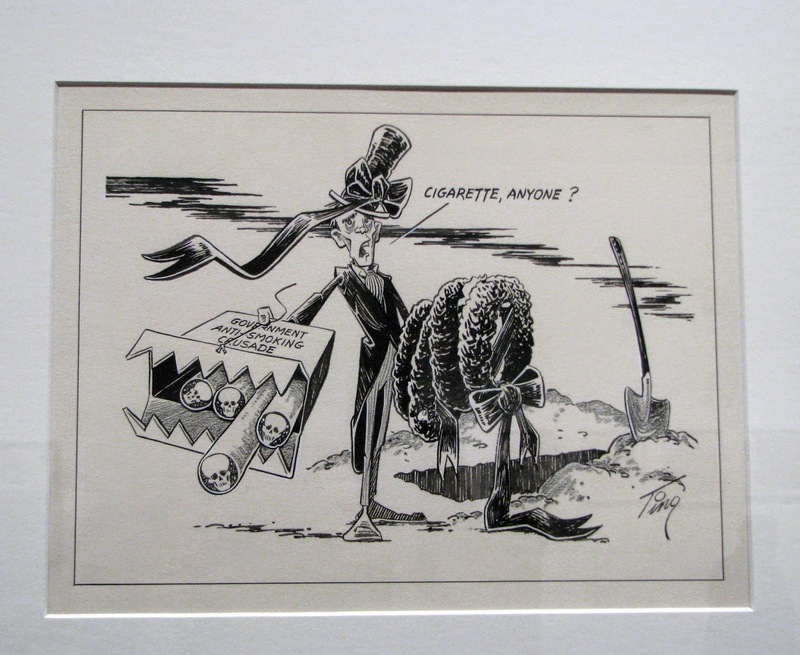 The festival was organized by local graphic artist Diana Tamblyn as a tribute to Merle Tingley, better known as "Ting", whose editorial cartoons appeared in the London Free Press from 1948 - 1986. 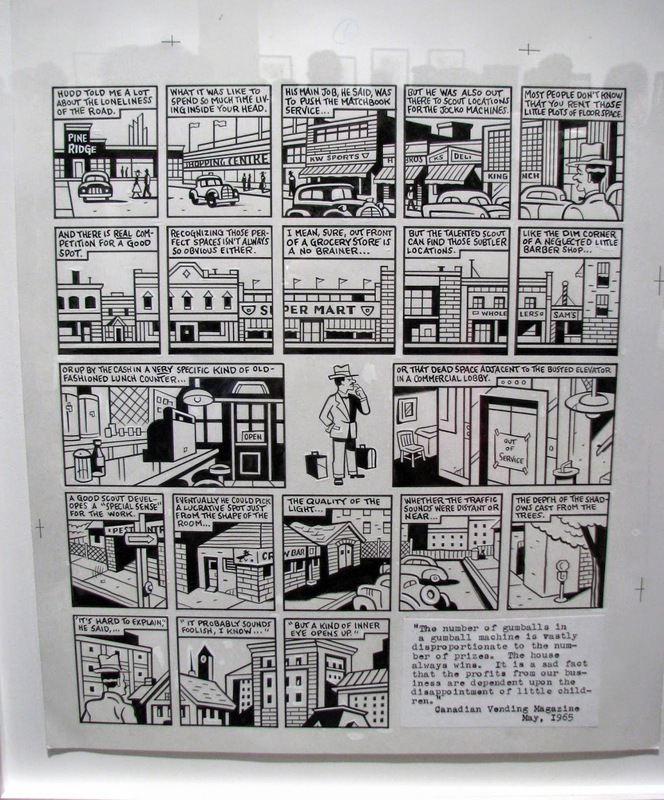 The Arts Project exhibit included work by 14 other Southwestern Ontario comic and graphic artists, many of whom were influenced by Tingley. 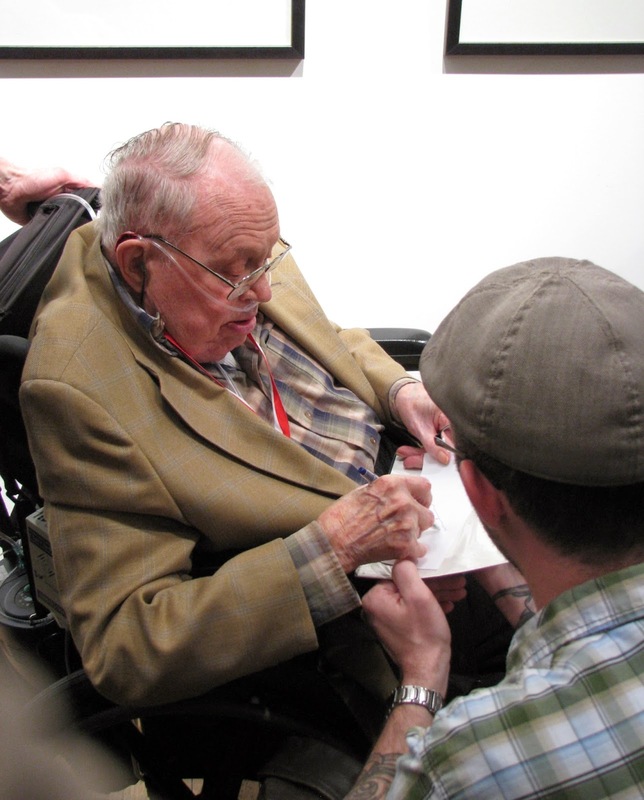 The opening provided an opportunity for them to meet Tingley, and for him to meet some of the artists who were inspired by his work. 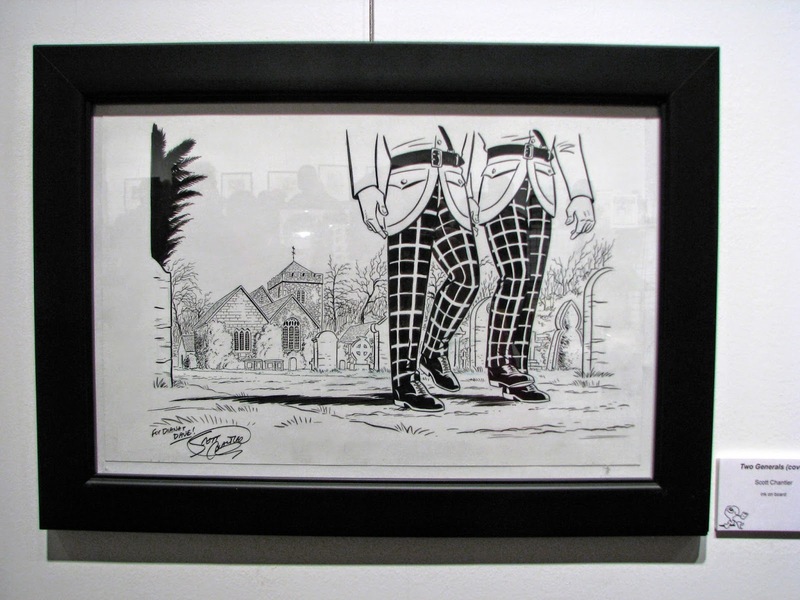 Tingley, now 92, was the guest of honour at the opening party, and many fans of his work asked him to autograph copies of his cartoons. 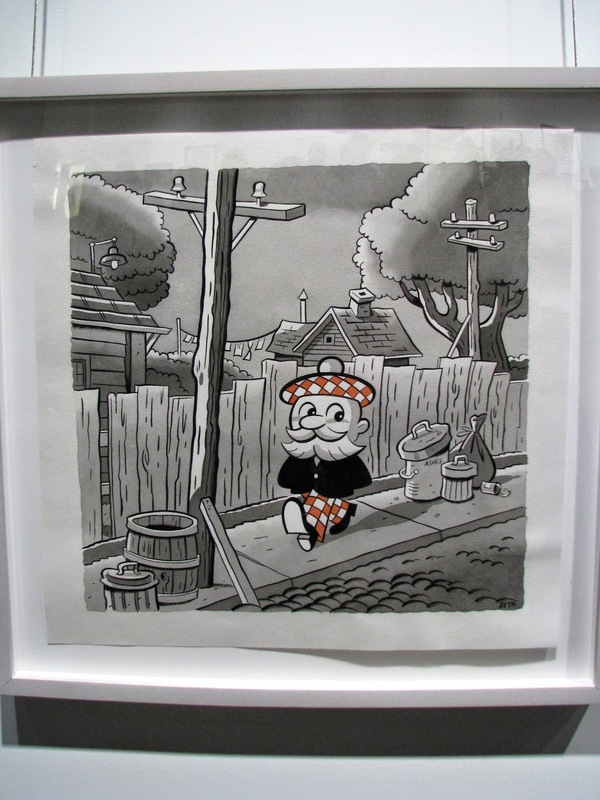 The exhibit of cartoon art included a section devoted to Ting's work that included pieces from Western University's "Ting" archive. 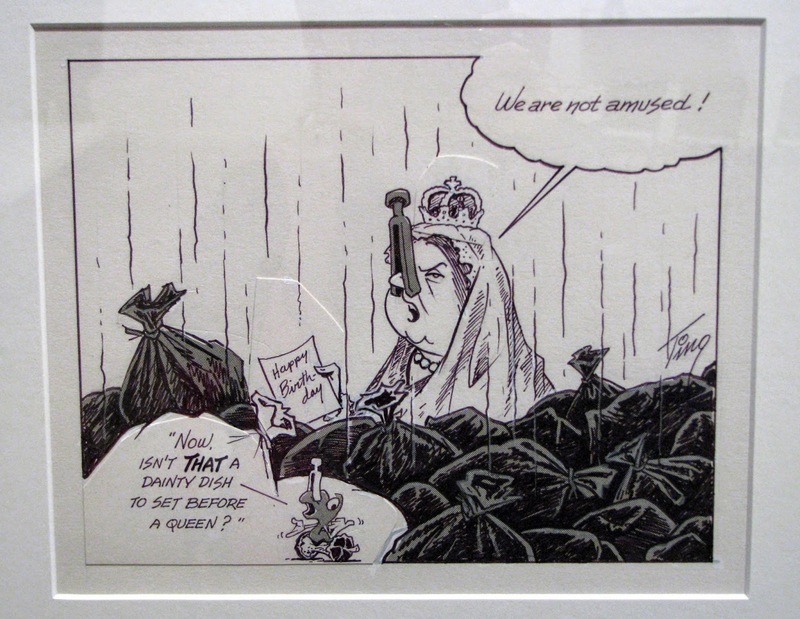 The cartoon above was done at the time of the May 1987 garbage strike. Ting always incorporated his mascot, "Luke Worm" into his cartoons. 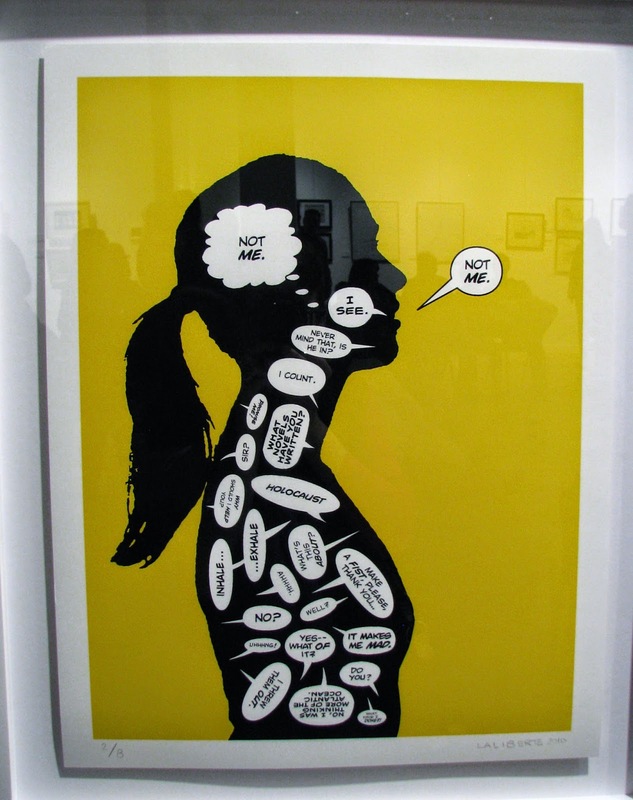 A piece by Jeff Lemire, an award-winning cartoonist and writer, author of The Nobody, Sweet Tooth (from which the above image is taken), and The Essex County Trilogy, and more. The cover of Scott Chantler's graphic memoir Two Generals, based on his grandfather's experiences in WWII. 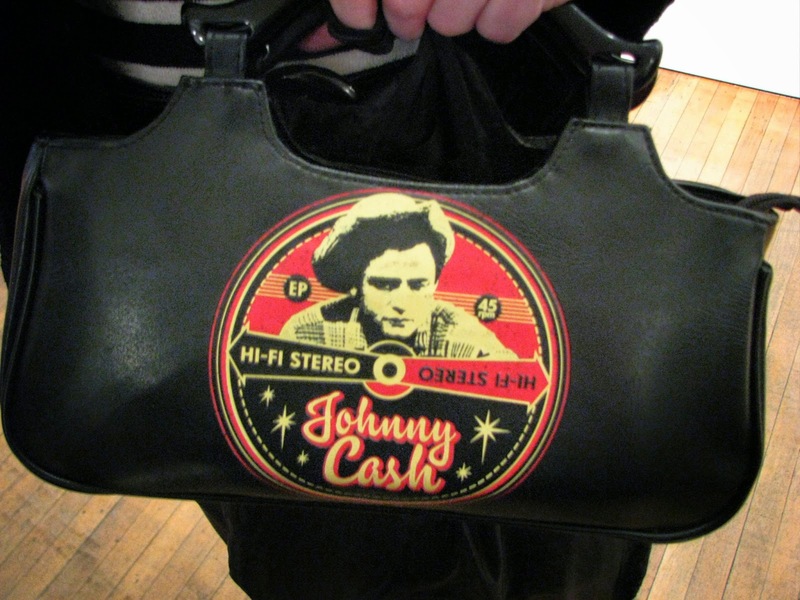 I ran into Linda, the woman with the fabulous clock purse from my Museum MakerBus Event post, and she was carrying yet another cool purse, this one featuring one of my favourite Country musicians. I was excited to meet cartoonist Seth and his wife Tania Van Spyk. 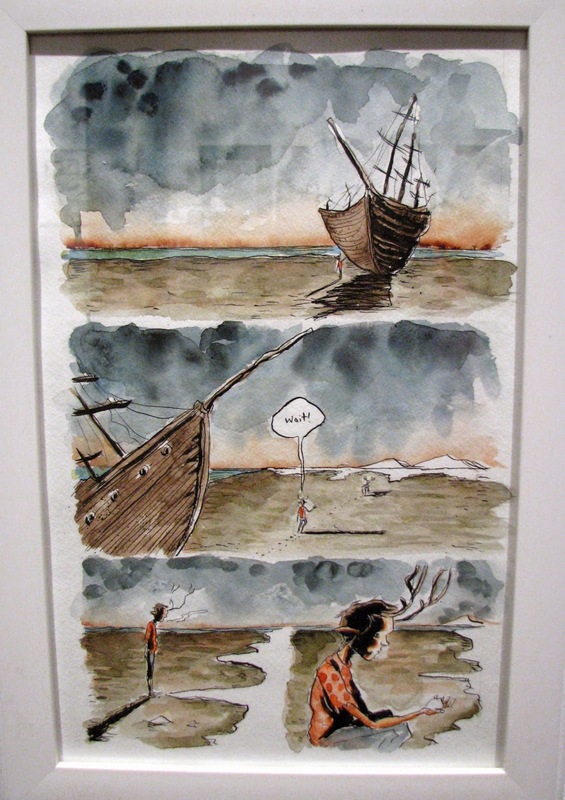 Seth's work is characterized by an affection for the past, particularly the early to middle 20th Century, and lonely characters searching for meaning in their lives. Van Spyk is a barber, and owner of the Crown Barber Shop in Guelph, which was designed by her husband. You can read about the barber shop (and see photos) here. I love their personal style, which in Seth's case, is inspired by the era he feels most connected to. They were easily the coolest couple in the room. One of the reasons I enjoy Seth's work is the feeling of nostalgia that permeates his stories. Seth was quoted in an interview as saying, "The modern world is very ugly...and the pop culture so mind-numbingly dumb that you have to make an effort to shut it out....I just like things from the past better. I don't want to live in 1932, but I sure wish that some of the elements of that time survived into this time." I would have to say that I share many of those feelings. You can read the full interview here. The festival, which ran for two weeks and finished on Saturday (which was also Free Comic Book Day), included other events such as workshops, talks and panel discussions. i really like seth´s cartoon style! 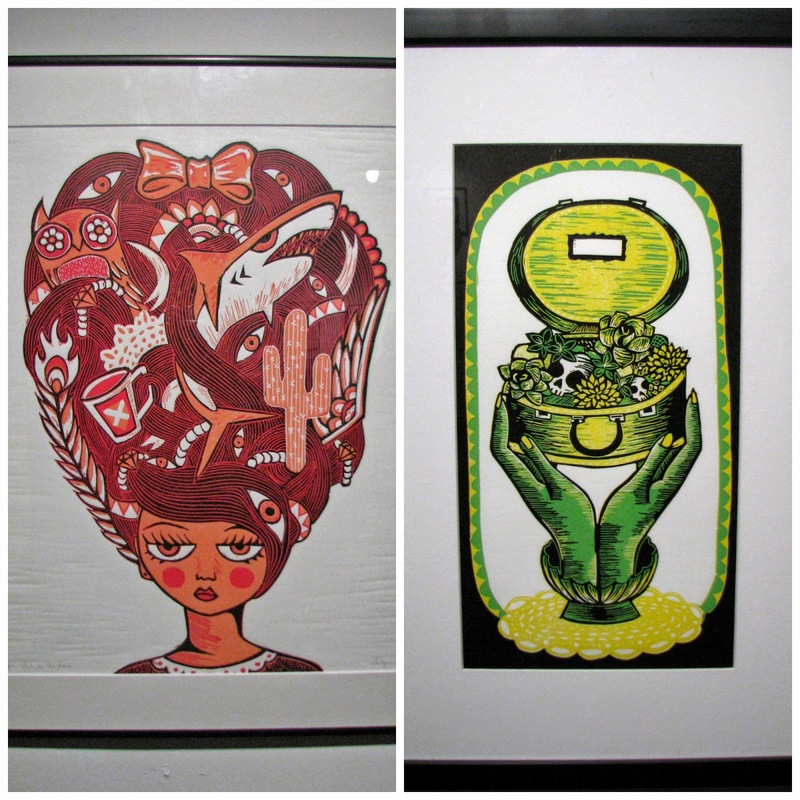 I love those lino cuts. Wonderful that Merle Tingley was able to be there, what an honour for all those he inspired. What a cool event, Shelley - you do some really interesting stuff, you know! You do awesome event posts. Thanks so much & glad you enjoyed the event! My you really do get around, Shelley. Kudos to you kid for keeping us up to date on the art scene as well as stylin'! Another amazing review of an event that you bring to life with your photos and commentary. I've learned so much about London and Toronto since I've been following you. Seth and Tania do make a striking couple. I'm sure that you were magnificent as well!